Today we say farewell to boring white walls! In this special feature we’ll explore 8 beautiful kitchens that break all the rules. 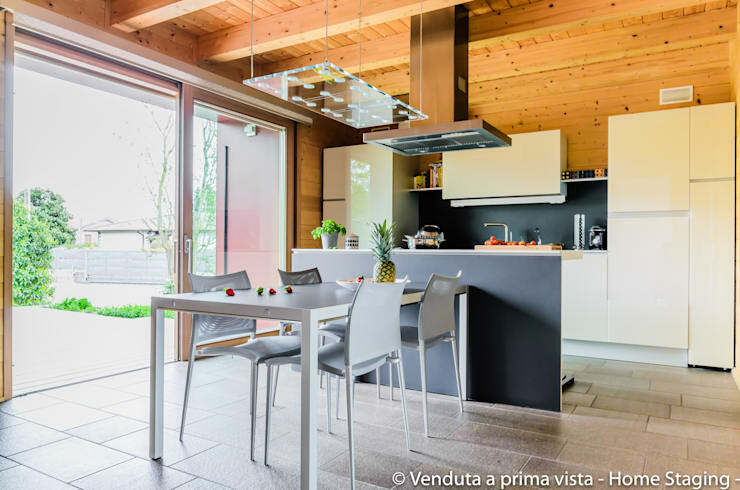 In these 8 examples you’ll see how different colours and patterns mix together giving the room an explosion of creative personality without forgetting about functionality. After all the kitchen is hands down the central hub of the home. For many of us it’s our favourite room of the house, and more than a place to just gather and eat. We feel the kitchen should be multi functional and reflect your unique personal style. Let’s see how homify's industry professionals make this space feel more vibrant and homey. Mixing natural elements together automatically makes any space feel more warm and inviting. In this case the exposed brick wall adds a rustic charm to the otherwise modern looking kitchen. The bright pop of colour against the light wood finishes brings a lovely balance to the room. A refreshing change from the typical white walls we are all used to seeing. Who says we can’t use wallpaper in the kitchen? Wallpaper has made a triumphant comeback these days, and one can get really creative with all the options that are available today. It's a perfect way to customize this space and make it feel like your own. We love the hanging lights and the modern industrial vibe this kitchen has. 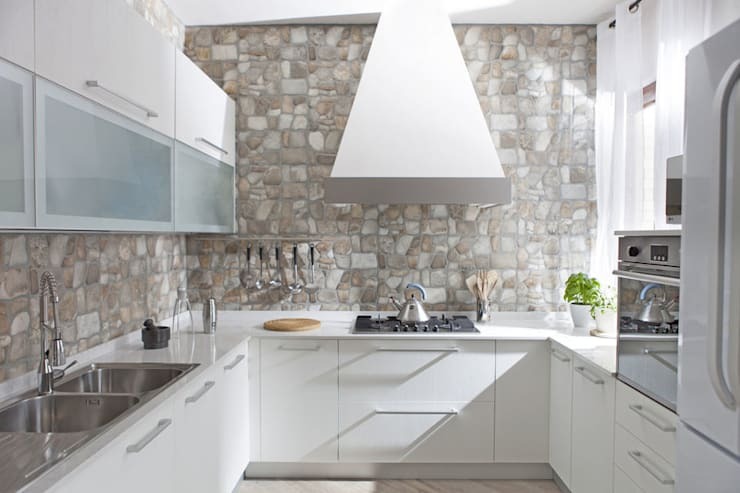 Stone finishes are another great way to use texture to create an appealing kitchen environment. Stone elements fused with the modern stainless steel appliances give this kitchen a bold disposition that is anything but lackluster. The wood and slate materials really do wonders at bringing this kitchen together in a rustic meets modern way. We love the natural exposed beams in the ceiling and how it contrasts with the neutral slate floors. This kitchen isn't missing a thing. If you love the rustic style you may want to have a look at this ideabook as well: 23 ravishing rustic kitchens. 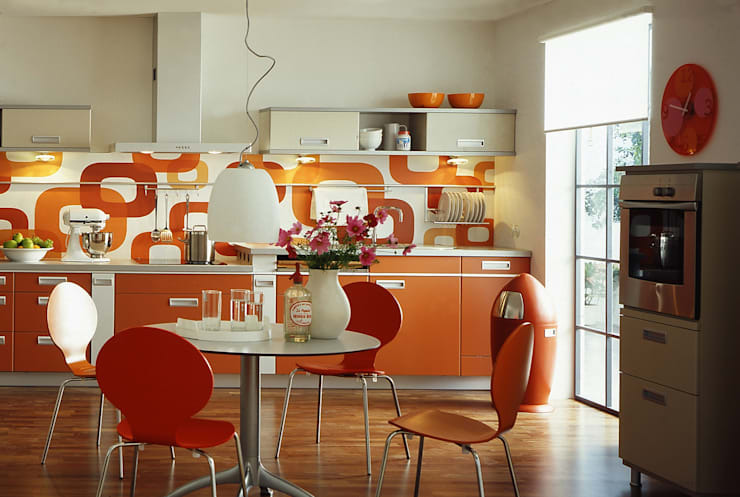 Here is a real treat for all you 70's lovers, this kitchen is a welcome blast from the past. 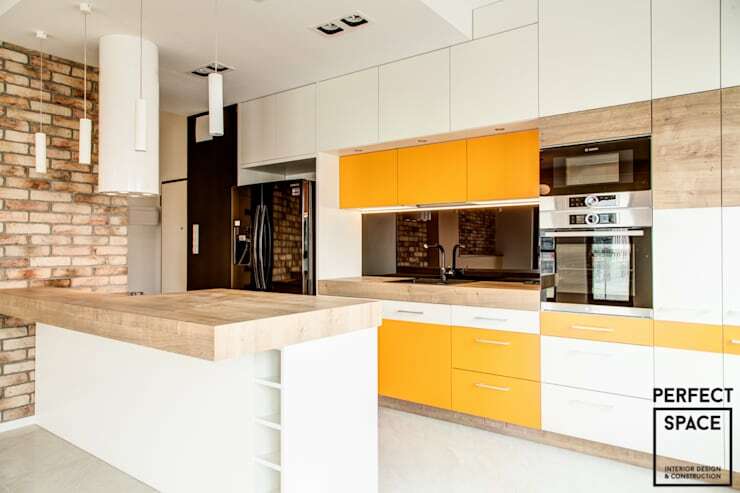 The rusty orange colour gives this kitchen a playful yet dramatic atmosphere and complements the hardwood flooring well. We adore this retro kitchen and all its splendor. This kitchen has traded its white walls for neat whiteboard cupboards. This is a fresh and fun way to create an interactive environment in the kitchen. You can easily jot down your grocery list, recipes, notes, or play some games with the kids while you prepare dinner. 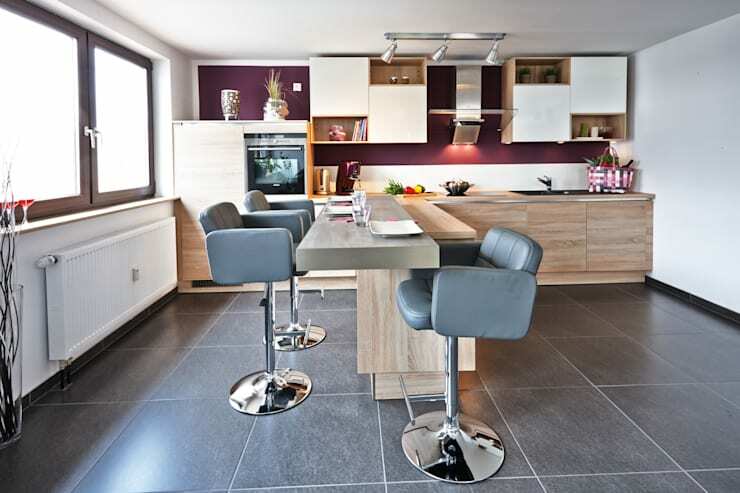 Limiting the use of white, and opting for a whimsical purple shade makes this restaurant style kitchen feel like home. We love the creative use of colour and fusion of texture happening in this space. The grey skins on these chairs mix well with the existing colour pallette in the room. 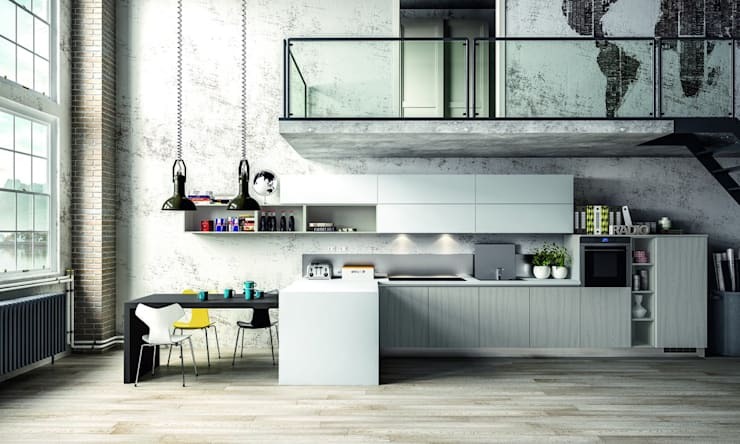 What's not to love in this sleek modern kitchen? The yellow pops of colour do an amazing job of bringing out the shiny surfaces throughout the room. 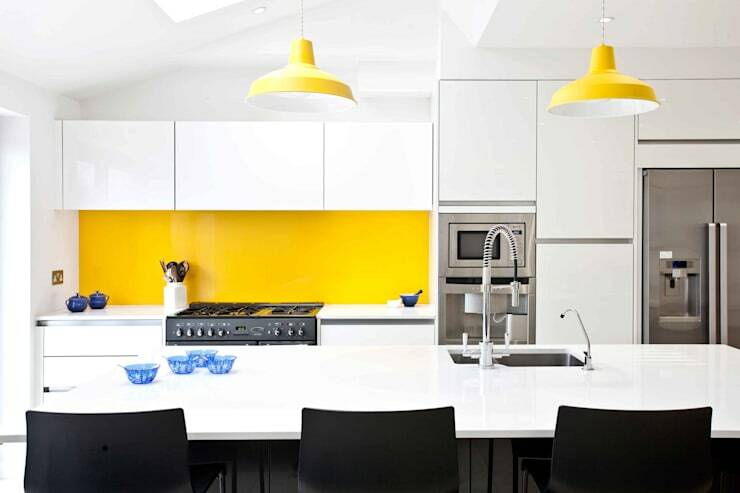 The bright yellow light fixtures blend exceptionally well with the darker bold colours in the chairs and appliances. What do you think about these kitchens? Are they a breath of fresh air compared to the drab and boring white walls we see all too often? We hope they inspire you to think outside the box when it comes to designing this multi purpose space. Tell us your thoughts in the comments below!